Which Golf Hitting Net Is Right For You? A great way to practice at home is by purchasing a golf hitting net. These practice nets come in a variety of shapes and sizes, are portable, and store relatively easily. Like any golf product, not all golf hitting nets are created equal! There are certainly cheaper options, but many of the brand name nets will feature a higher quality of build and will likely last longer. While the majority of practice nets are to be used with your woods or long irons, this net is different. This net is to help you with your short game. It looks a little different than your standard golf practice net because you are trying to hit onto it as opposed to directly at it. It is smaller than the traditional net, which makes it more portable. My favorite part about this net is that it has three separate sections to hit into. This will allow you to really work on your accuracy. 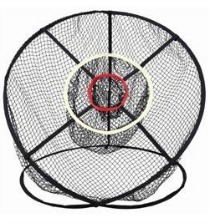 This net works great when setup in the back yard or field to give you some valuable chipping and pitching practice. If you have a mat and a lot of space in doors, you could even practice some short shots with whiffle balls in your house! Overall, I really like this golf practice net and I think that it can really help your short game. When looking for a larger net to use with all of your clubs, not just your short irons, I think that this golf hitting net is a solid choice. One key feature is stability. This net comes with five ground stakes to help keep it firmly connected to the ground even after the most powerful drives. The net is also wide and features an adequate depth to accommodate errant shots and/or full swing shots. The target is the middle also gives you something to aim for. This net is large at 10'x8'x5', but it also is portable, as it comes with a carrying case. I feel that this net is a great choice for working on your proper golf swing, especially when you compare its price to other similar nets. While Callaway makes great products, I think that the main advantage of these nets is the various sizes that are available. They come in 6 foot, 7 foot, and 9 foot variations so you can pick one that works the best for your needs. These nets are sturdy and give you are target to aim for. However, you will likely be paying a premium for the Callaway name. Even the smallest version of these nets is more expensive than the 10' RJ Sports net. This is a golf practice net that I just discovered recently. The key advantage of this net is that you get three products that are typically sold separately, together in one package. The three items are a relatively large practice net (11 x 7 x 5.5), a small pitching and chipping net, and a hitting mat with both a tee and artificial grass surface. Also, all of the items can easily be stored together for travel or in the winter in the supplied nylon bag. As I mentioned above, the hitting net is quite large. 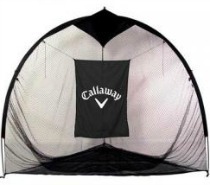 It is larger than any of the Callaway nets and just slightly larger than the RJ sports net. While I do not think that the chipping net is of the same quality of the Hank Haney net, when you are getting all three of these items for the price of one, who is to argue??? I decided to add this golf hitting net to the list for those people for which money is no object! This truly is the best of the best of practice nets (and it's price reflects that)! The Net Return Pro Series net stands 7 and a half feet tall and is 8 feet wide. Despite its large size, it only weighs approx. 28 pounds. It is very quick to assemble and is appropriate for both indoors and outdoors. The key feature of this net is the ball return system. Each shot is returned right to your feet, saving you valuable time rounding up all of your golf balls. This will allow you to spend more time doing what you need to do to get better! Also, the net is large and sturdy enough to be used for a wide variety of sports including baseball, football and soccer. Works really well for multi-sport athletes or even families which children playing a different sport each season. The only downside that I see (no counting the price tag), is that if you want a practice mat to hit off of, you will need to pay extra for that product as the net itself does not include a mat.